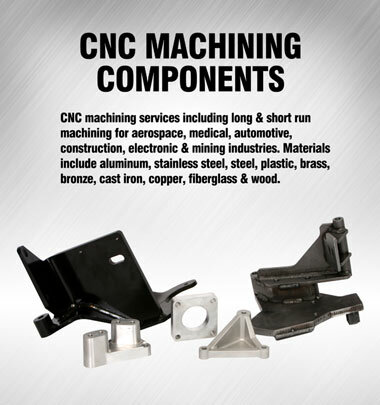 Full CNC milling capabilities including both vertical and horizontal CNC mills. Our horizontal mills have twin pallets, so all loading and unloading is done in cycle to reduce costs. Cannon offers long and short run machining services for aerospace, medical, automotive, construction, electronic and mining industries. Cannon has full CNC milling capabilities including both vertical and horizontal CNC mills. Our horizontal mills have twin pallets, so all loading and unloading is done in cycle to reduce costs. They are also large bed machines which allow us to produce very large parts, or the ability to integrate 5–6 vices and/or fixtures to run a number of different parts at the same time. This increases cycle times and decreases manual operations, and there is more opportunity in cycle to do deburring and inspection operations. Some customers that need a casting, before they invest in the casting, have asked Cannon to produce a CNC machined component that has a draft characteristic of a casting. The component is more difficult to produce because there are typically slight two to four degree angles on these parts. But it is a huge cost savings to the customer because they can avoid re-tooling the mold to create a casting. More intricate components we have manufactured include the valve body for the bottom of a transmission and engine mounts. Our experience includes Department of Transportation products used for a Humvee antenna mount.